Seagrass meadows provide valuable ecosystem services for human well-being. They are threatened by increasing human development on coastal areas, which results in eutrophication and ecosystem degradation. The negative effects of anthropogenic pressures on Zostera noltei meadows in NW Spain are unknown. This study aims to explore the relationship between watershed human development (i.e., the demographic temporal evolution and land cover indicators of human pressure) and the C and N isotopic signatures determined in Z. noltei seagrass meadows located in the related estuarine areas. We measured δ15N, δ13C, and the C:N content of sediment cores, Z. noltei leaves, and epiphytes collected from three seagrass meadows located at NW Iberian Peninsula characterized by well-differentiated watersheds in terms of the intensity of the anthropogenic pressures (Caldebarcos, Lourizán, and A Ramallosa). 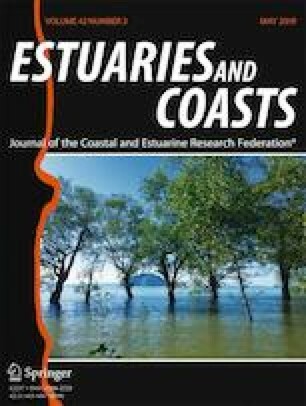 Ages and sedimentation rates were estimated by 210Pb/137Cs dating of one sediment core from the A Ramallosa seagrass meadow, corresponding to the most populated and urbanized watershed. Magnitudes of anthropogenic pressure on the watersheds were determined by the analysis of historic demographic data and the quantification of land cover changes obtained from CORINE Land Cover database. The intense anthropogenic transformation observed in the A Ramallosa watershed resulted in increases of sedimentation rates in the Z. noltei meadow. δ15N and δ13C signatures revealed the effects of anthropogenic nitrogen inputs. Sediment δ15N was the variable that best performed as an early warning eutrophication indicator, whereas δ15N in Z. noltei and epiphytic material were less coupled to the magnitudes of artificial land and population density on watersheds. The authors thank Aida Ovejero Campos for her field support and Maria Lema for her help with isotopic analyses. This study was funded by the Ministry of Economy and Competitiveness through project REIMAGE (grants CTM2011-30155-C03-01 and CTM2011-30155-C03- 02). M. Román was supported by a PhD fellowship from the Xunta de Galicia. Alonso, M., Remondo, J., Bonachea, J., Fuffa, E., Cendrero, A., 2015. Datación e interpretación de la sedimentación reciente en estuarios mediante la técnica de 210Pb en exceso. XIV Reunión Nacional de Cuaternario, Granada 2015. http://geoserver.ugr.es/aequa15/wp-content/uploads/2015/06/S09-05.pdf. Accessed 15 June 2018. Dang, C., P.G. Sauriau, N. Savoye, N. Caill-Milly, P. Martinez, C. Millaret, J. Haure, and X. De Montaudouin. 2009. Determination of diet in Manila clams by spatial analysis of stable isotopes. Marine Ecology Progress Series 387: 167–177. https://doi.org/10.3354/meps08100. Duarte, C.M., Marbà, N. y Santos, R. 2004. What may cause loss of seagrasses?. In J. Borum, C.M. Duarte, D. Krause-Jensen, T.M. Greve (Eds.). European seagrasses: an introduction to monitoring and management. EU project monitoring and managing of European seagrass, (M&MS) (2004), pp. 24–32. Available at www.vliz.be/imisdocs/publications/67183.pdf. Accessed 1 May 2018. García-Orellana, J. and Sánchez-Cabeza, J., 2012. El 210Pb como trazador de procesos ambientales. In Sanchez-Cabeza, J., Díaz-Asencio, M., Ruiz-Fernández, A. (Eds). Radiocronología de Sedimentos Costeros Utilizando 210Pb: Modelos, Validación y Aplicaciones. Organismo internacional de energía atómica. Viena. https://wwwpub.iaea.org/MTCD/Publications/PDF/P1538_S_web.pdf. Accessed 15 June 2018. Hernández-Borge, J., 2007. Población vinculada y residencias secundarias en Galicia. Boletín de la Asociación de Geógrafos Españoles, (43), 73–84. http://www.age-geografia.es/ojs/index.php/bage/article/viewFile/582/536. Accessed 23 Feb 2017. Mateo, M.A., 2015. El valor de las praderas de angiospermas marinas. En: Ruiz, J.M., Guillén, J.E., Ramos Segura, A. Otero, M.M. (Eds.). Atlas de las praderas marinas de España. IEO/IEL/UICN, Murcia-Alicante-Málaga: 64-69 pp. https://www.iucn.org/es/content/atlas-de-laspraderas-marinas-de-espa%C3%B1a. Accesses 15 Dec 2017. Sánchez-Cabeza, J, Ruiz-Fernández, A., 2012. Modelos de fechado por 210Pb. In Sanchez-Cabeza, J., Díaz-Asencio, M., Ruiz-Fernández, A. (Eds). Radiocronología de Sedimentos Costeros Utilizando 210Pb: Modelos, Validación y Aplicaciones. Organismo internacional de energía atómica. Viena. http://www-pub.iaea.org/MTCD/Publications/PDF/P1538_S_web.pdf. Accessed 15 June 2018. Sánchez-Lizaso, J.L., Ruiz, J.M., Bernadeu-Esteller, J., 2015. Causas del deterioro y pérdida de praderas marinas en España: El impacto del hombre. En: Ruiz, J.M., Guillén, J.E., Ramos Segura, A. Otero, M.M. (Eds.). Atlas de las praderas marinas de España. IEO/IEL/UICN, Murcia-Alicante-Málaga: 70-79 pp. https://www.iucn.org/es/content/atlas-de-las-praderas-marinas-de-espa%C3%B1a. Accessed 15 Dec 2017. Voss, M., B. Larsen, M. Leivuori, and H. Vallius. 2000. Stable isotope signals of eutrophication in Baltic Sea sediments. Journal of Marine Systems 25 (3-4): 287–298. https://doi.org/10.1016/S0924-7963(00)00022-1, https://doi.org/10.1016/S0304-4203(97)00073-X.